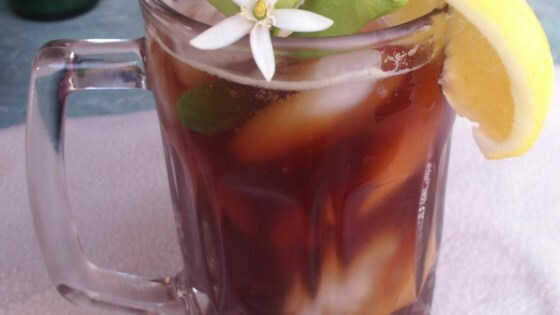 "A simple sweet tea recipe that anyone can do." Bring water to a boil in a pot. Dissolve sugar in boiling water; remove from heat. Steep tea bags in water to desired strength of tea, 3 to 5 minutes. Refrigerate tea until cold, at least 1 hour. When using individual tea bags, your best option is to remove all the paper endings, and tie the strings together. Before I chilled the tea, I floated lemon rings on the top. Refreshing. My husband had this whole batch gone in 24 hours. I will use this recipe again but I might cut back the sugar just a touch. Use 1.5 cups of sugar and juice of 1 lemon. Best way to have sweet tea!!!! This is how we have always made tea in North Georgia. I do use 1-1 1/2 cups of sugar. We love it! The tea was good. But it was bit too sweet. It was really sweet and I loved it but my mom perfered more tea. I put only eight regular tea packets in it and it tasted good to me!